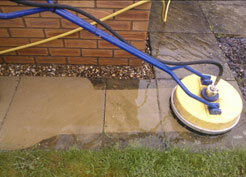 High pressure cleaning is a very effective way of cleaning many different types of surfaces. 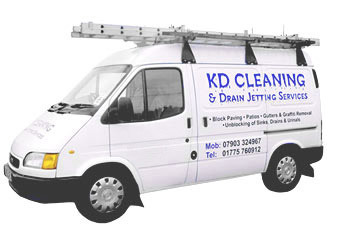 KD Cleaning uses the Whirl-away system for cleaning, this is a water saving device that cleans all types of flat surfaces including block paving, patios and concrete floors. The photo on the right shows how effective the Whirl-away system is! The action of the whirlaway is superior to conventional jetting techniques - conventional equipment may actually damage the surface being treated, in using less water the whirlaway creates less mess while conserving resources and it creates an even finish. See below for a video of the Whirl-Away machine in action! 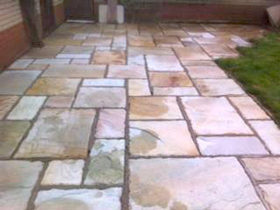 We are also able to restore dirty block paving using the water saving whirl-a-way system, which cleans the blocks efficiently without causing any damage. 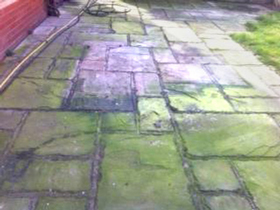 Problems with weeds: On occasions we will need to apply a weed killer, before cleaning commences to break down the root base, to help prevent weed regrowth. 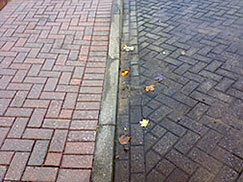 This can be a real problem especially on footpaths and walkways as it can be very slippery under foot. Look at the before and after photos to see the difference after the whirl-a-way has been used. This eliminates any use of harsh chemicals. 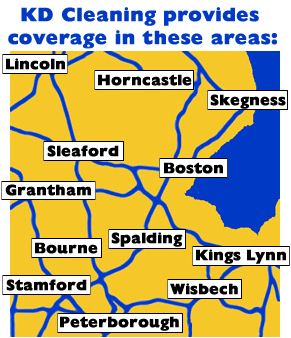 Service coverage area inc. Spalding, Holbeach, Kings Lynn, Boston, Peterbrough, Skegness, and surrounding areas.